Elrico Plaatjies, Portia Mopeli, Mpai Thekiso, Resona Ontong, Teddy B Mhlambi, Boipelo Monnamorwe, Wendy Moloi and Zane Muller. The celebrated House of Dirty Shakers (HoDS) is back on stage with their second Casino set-up show following a Night of Song and Dance in 2016. 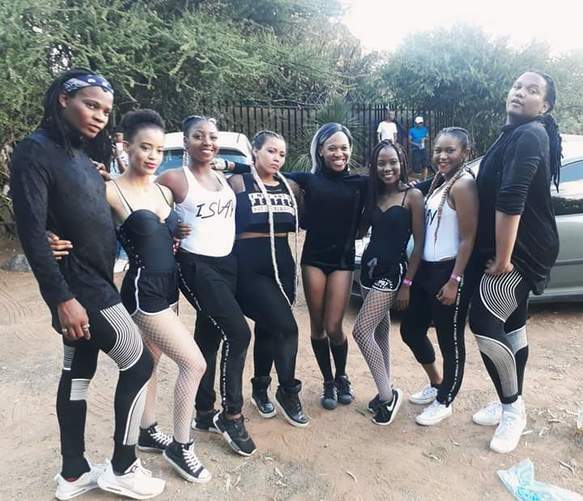 The well-known Bloemfontein dance crew will take to the stage with their new production “Head over Heels” this coming weekend. The show has an interesting storyline (which we can’t give away), accompanied by costume, choreography and music which will ensure that the audience remains entertained throughout the show. The 30-minute show to be done in heels, features a variety of dance styles and is something the audience can look forward too. The show was conceptualised and choreographed by House of Dirty Shakers with Zane Muller and Teddy B Mhlambi as head creative directors of the show. According to Muller, director and founder of HoDS, they decided to do the show to introduce some fresh talent they have in their 2019 team. “Also to show the amount of growth that we have encountered since we’ve last performed at the Windmill Casino. The show is in collaboration with Whispers on the Run, which also promotes local talent in Bloemfontein,” said Muller.